Female microptera. 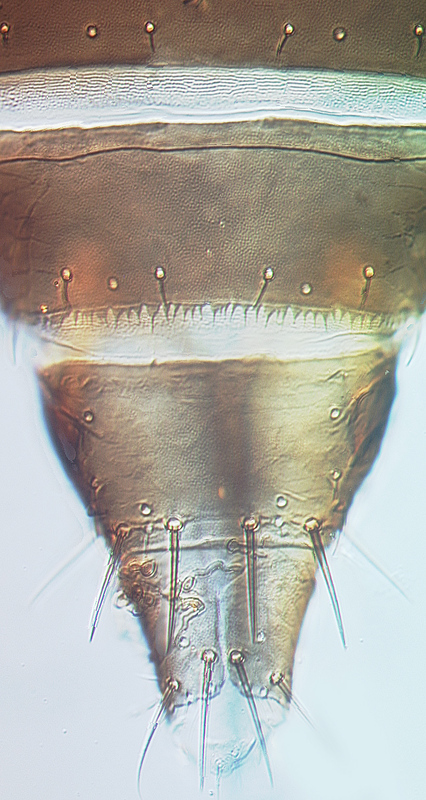 Body and legs brown to dark brown, all tarsi, apices of tibiae and median area of head paler; antennal segments I–II and V–IX brown, III–IV brownish-yellow. Head wider than long, with transverse sculpture behind eyes but none near ocelli; ocelli reduced, ocellar setae III within or near anterior margins of triangle; eyes without pigmented facets. Antennae 9-segmented; III–IV with small forked sensorium; II without microtrichia; VI with base narrowed and weakly pedicellate. Pronotum with transverse striae; with no long setae and few small discal setae. Meso and metascutum transverse, campaniform sensilla present. Fore wing lobe scarcely longer than metascutal length. Abdominal tergites I–VII with transverse sculpture lines medially, VIII almost without sculpture; VIII with posteromarginal comb of irregular, short and partially fused microtrichia, spiracles occupying half of lateral margin of tergite; tergal setae S3 and S4 no longer than S1 and S2; setae on IX shorter than dorsal length of tergite X. Sternites with a few short microtrichia on sculpture lines laterally; setae S1 on VII close to posterior margin. Male microptera. Similar to female but smaller and paler; tergite VIII with irregular comb, IX with two pairs of short stout setae; sternites III–VII each with small, curved, weakly C-shaped pore plate. There are 43 species of Anaphothrips known from Australia, out of a total of 79 species worldwide (Mound & Masumoto, 2009). Many of these species have the antennae clearly 9-segmented, others clearly have only 8 segments, but several species have an intermediate condition with segment VI bearing a partial and often oblique transverse suture. 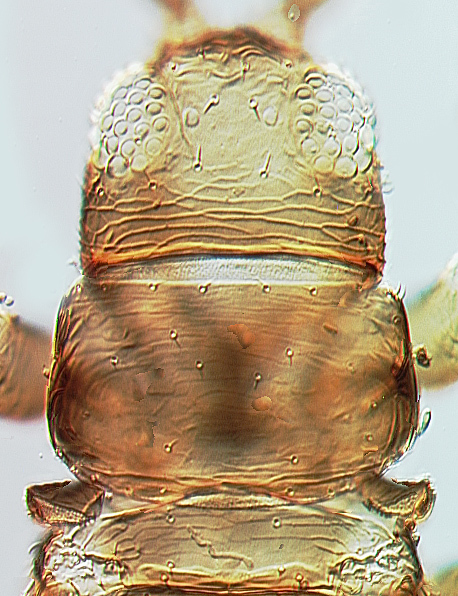 The micropterous adults of A. monga have unusually large spiracles on tergite VIII, a character state that occurs in several Australian Anaphothrips species, particularly in grass-living species such as A. moundi. Anaphothrips monga Mound & Masumoto, 2009: 42.